Visitors of a certain taste and temperament will want to move into Anna Sui’s SoHo boutique as soon as they experience its urban-bohemian decor. The designer’s style is evident in every aspect of the shop. Her playful, gothic-romantic frocks are displayed in black-painted, antique wardrobes. Costume jewelry glitters in the light from Tiffany-style lamps, the purple walls are hung with vintage rock posters and Aubrey Beardsley prints, and early Cure albums play over the stereo. 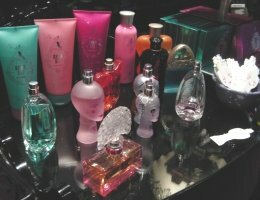 Anna Sui’s line of perfumes is arrayed on a low table near the front of the store, where shoppers can easily spritz and test the winsomely packaged scents. The shop’s young, enthusiastic sales associates (all Sui-clad from head to toe) are ready to demonstrate the fragrances and their matching body products. They will also assist with sampling the Anna Sui cosmetics line of sparkly nail polishes, pearly lipsticks, and vibrant powders for eyes and cheeks, all displayed near the perfumes on a vintage vanity table. If the overall atmosphere appeals to you, you’ll find it difficult to leave without at least one perfume, a print scarf, or a rose-shaped lip-gloss compact. Not to be missed: The faux-lacquer vanity accessories, for keeping all your fragrances and beauty products stylishly organized. 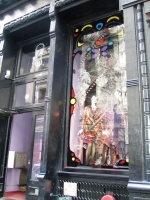 Details: Anna Sui, 113 Greene St., New York, NY 10012; 212-941-8406; website. — report & images filed by Jessica M.
See also: Perfume Shopping in New York City.